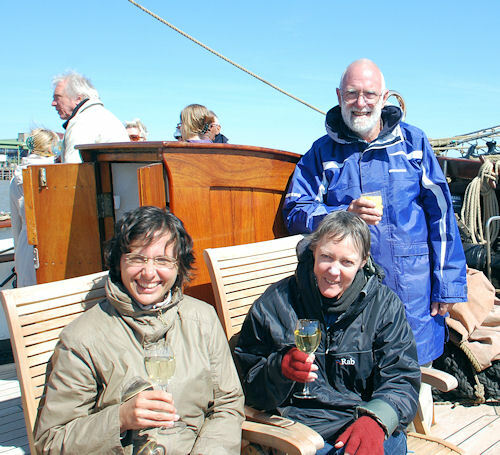 After two parties in Australia the celebrations go westward and now reached Elsfleth on the tidal Weser river. 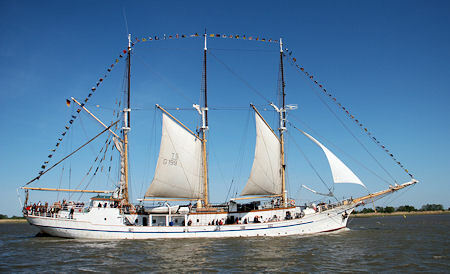 The place was picked as the Eye was built in the nearby town of Brake and her current owner Ronald Herkert did his naval degrees at the nautic college in Elsfleth. Deb and Tiger were invited to the celebrations as I was, too, so we went there together. First of all: she's clearly on the rising branch. When I first saw the ship after the Danish years in 2009, she had a number of smaller and bigger scars and problems that only didn't feel so sad as the whole ship felt so different and did not make me think it was the same I used to know. All that is gone and I promise you'll love her sight. But to start with the beginning: Tiger, Deb and I arrived on Friday in the little, but nice town of Elsfleth. The beginning of the official celebrations was scheduled for Saturday, 6 am, so there was time left to recover from the flight or to visit the nautic museum of Brake. Tiger and I rented bikes and went there. On the way back, we also had a look at the former Lühring shipyard. The shipyard itself went bankrupt in 1989 and people believe it was due to management mistakes while the quality of their ships remained marvellous all the time. The area is now used by a different company, supplier of ships parts and devices, but apparently they're not too busy. 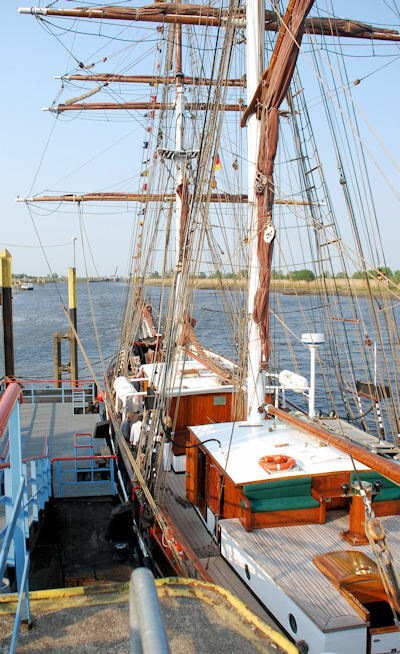 Saturday morning, when it was clear and sunny, but really chilly, the Eye and the local "Großherzogin Elisabeth" left Elsfleth for Bremerhaven to celebrate the reopening of the Kaiserschleuse, an old now enlarged lock with gates of the new Panama size. On the way, we passed Brake and the former Lühring shipyard. 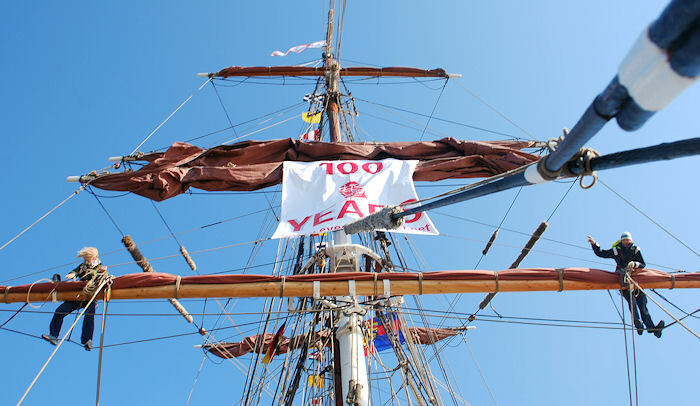 The reopening of the locks was planned as a big party with a number of prestigious tall ships and the longest parade of sailing boats for the Guiness book of records. 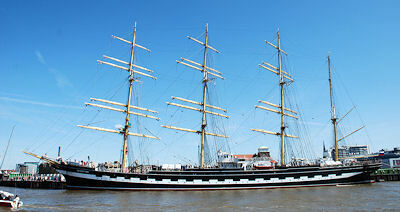 So we've seen a bunch of famous vessels like "Sea Cloud", the former Flying-P-Liner "Kruzenshtern", "Alexander von Humboldt" and two cog replicas. 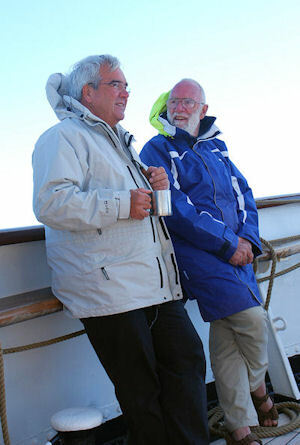 The whole trip took some 11 hours and there was lots of time to have for chats and on the way back even some sail handling. 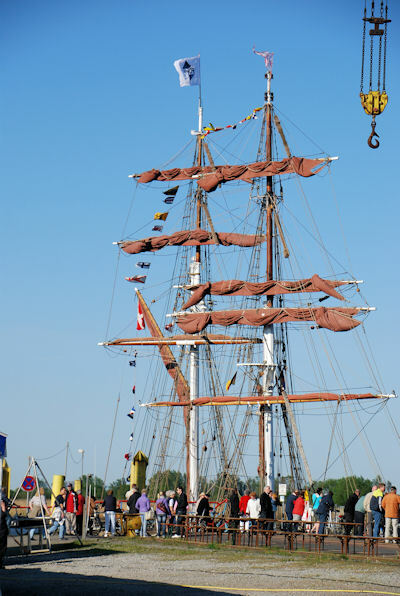 Also the accompaigning "Großherzogin Elisabeth", shorter called "Lissy", set sails and as we kept changing positions there were plenty of opportunities for nice shots of ships and people. Back in Elsfleth, we had the official centenary party in the evening with speeches of owner and authorities, with special mention of guests and supporters. 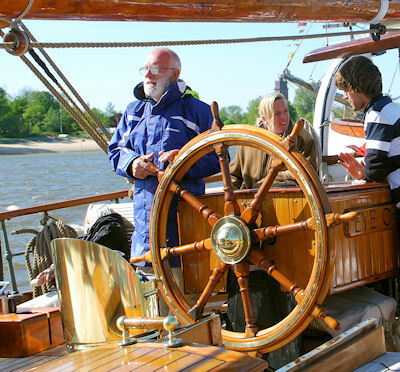 Apart from the already mentioned ones there were Claus Lühring, last owner of the Lühring shipyard, and Immo von Schnurbein, former commander of the Marine sail training vessel "Gorch Fock", now occasionally doing leadership trainings onboard the Eye. The next morning luckyly began as late as one liked to. So after breakfast we first visited the Elsfleth museum and then had a brunch in the party tent before heading off again. Deb and Tiger for Montenegro to Laura and Tony, me back home to Berlin. I didn't really want to go there in the first place, but I'm really glad I changed my mind. 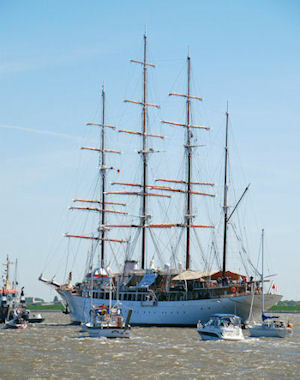 It was good to see how well the ship is again, to see people enjoying her and the possibilities she provides. Harmony and future are back on deck. She's going to have another good time.